Animate your still images with Artymate! Cascading waterfalls, soft moving skies, flowing water all possible directly within Photoshop with Artymate. Magically take elements from your still image, birds, butterflies, flowers, leaves, and watch as they lift from your page and animate in flowing, flapping, flying and floating motion. Choose your direction, and vary your animations with multiple pre programmed effects. Add custom video overlays created exclusively for Artymate. Add free flowing hair to your subject, wavy or straight. Change the color and tone with sliders to perfectly match your still subject’s hair. 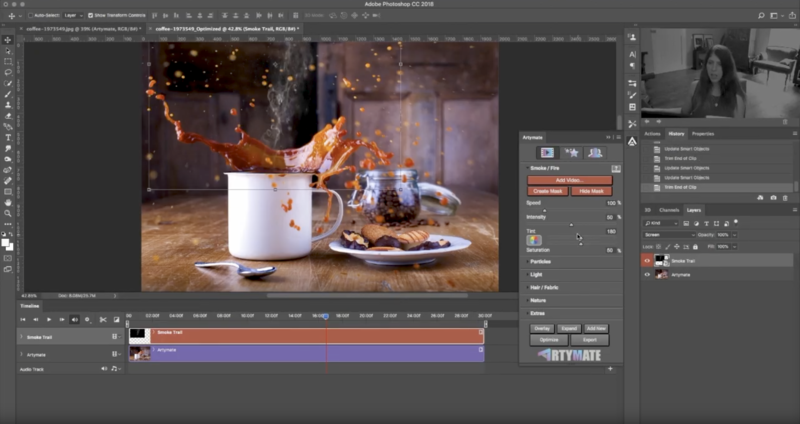 Add fire, smoke, particles and light to your animation. Gorgeous, beautifully blended effects that take your photograph to another level. Finally, export your incredible moving image ready to showcase online (perfectly sized for the web and social media looping). View the Tutorial Videos to find out more! Artymate will only work with Adobe Photoshop CC 2017 to Current versions, check your software prior to purchase. Refunds not available due to the digital nature of the product.